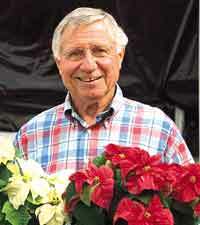 Paul Ecke Jr. was world renowned for his work in hybridizing and popularizing the poinsettia (Euphorbia pulcherrima). He built his greenhouse, Paul Ecke Ranch at Encinitas, California, into a world class research and production facility. Elwes was a British botanist and entomologist who was known for collecting new species of the genus, Lilium from Korea and the Himalayas. The Royal Horticultural Society awarded him the first Victoria Medal of Honour for his service in 1897. He wrote the Monograph of the Genus Lilium in 1880. The specific epithet, elwesii, was named for him. Plants with this name include: Galanthus elwesii and Rhodophiala elwesii. A German plant collector who worked primarily in Western Europe. The species, Geranium endressii is named in his honor. First century AD Greek physician to a Mauritanian emperor whose name was given by Dioscorides to the genus, Euphorbia.